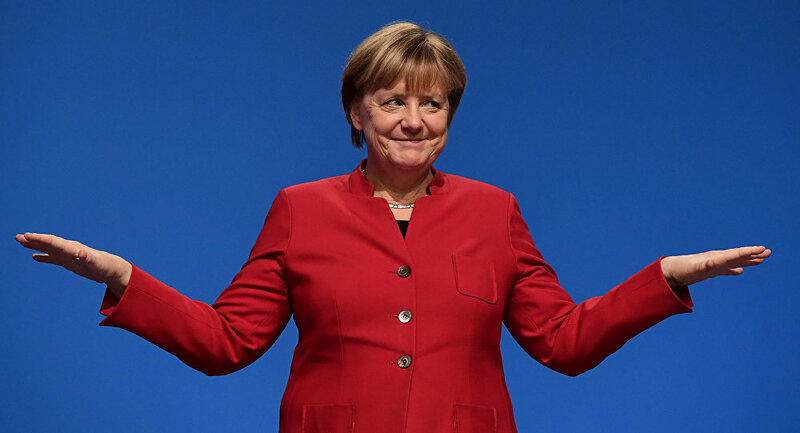 The German social democrat and conservative parties have finally agreed in a rotten compromise to form yet another not-so-grand coalition with the increasingly unpopular Angela Merkel as Chancellor. With this, it’s clear that Berlin is on automatic pilot in regard to such divisive policies as accepting hundreds of thousands of new refugees from southern hemisphere war zones such as Libya or Syria. In stark contrast to Berlin’s open policy, four countries in Central Europe—Poland, the Czech Republic, Hungary and Slovakia—are steadfast in their refusal and rejection of the Brussels-mandated compulsory refugee policies and are rallying more open support across the EU for more national self-determination. In this not all levers of power lie in Berlin . . The growing resistance of the four, united as the Visegrád Group, is opening a potential breakup of the European Union as Brussels steadfastly refuses to budge on policy and the populations across the EU stare on with disbelief and increasingly vote more national-oriented candidates such as the newly-elected Austrian Chancellor Sebastian Kurz of the Austrian Peoples’ Party. The concerted effort of Brussels and the liberal media to demonize leaders such as Hungary’s Viktor Orban, as some modern variant of fascist for defending national sovereign rights to decide who is welcome to become citizen and who not, is increasingly falling on deaf ears for ordinary Europeans who are bewildered at why their politicians refuse to abandon a clearly counterproductive refugee policy. On April 8 Orban faces re-election in a national vote where US hedge fund speculator and political NGO operative, Hungarian-born George Soros, is financing a massive effort to defeat Orban and his Fidesz party, though the opposition at present is very divided. In neighbor state the Czech Republic on 13 January voters gave incumbent Presidential candidate and euro-skeptic Milos Zeman a clear lead, though not the 50% needed to avoid a runoff. Zeman has criticized EU Russian sanctions and called for building economic ties to China as have other Central European states. He is also sharply critical of EU refugee policies. Together with Hungary and Poland, Prague has refused to contribute to the mandatory refugee resettlement quotas against strong pressure from the European Commission. The third strong proponent of the national right to determine who is citizen in its borders is Poland. In December the EU Commission announced that it would sue Poland, Hungary and the Czech Republic at the European Court of Justice (ECJ) for refusing to take in refugees. The EU is also suing Hungary for passage of a new higher education law that would likely force closing of the Central European University backed by George Soros and opposes a Hungarian law requiring foreign-financed NGOs such as those backed by Soros to file as “foreign funded.” Soros-backed NGOs in the EU are major proponents of major refugee inflows into the EU. And changes to the Polish constitution in terms of the judiciary led the EU Commission to exercise its controversial Article 7 procedure which could ultimately lead to suspension of Polish EU voting rights after Polish President Andrzej Duda defied Brussels warnings and signed the judicial reform. Because the Article 7, which has never been used until now, requires unanimous EU support, it is not likely as Orban’s Hungary has openly declared it will side with Poland. That leaves Brussels, increasingly seen as autocratic and desperate, with only the option to suspend EU aid to the Polish economy. Were that to happen, some Polish observers predict a Polish EU exit, a so-called Polexit, is possible, even likely. EU President, former Polish Prime Minister Donald Tusk has warned Poland could leave the EU if Brussels funds are cut. What is becoming a game of political chicken between Brussels, backed by especially France and Germany, to force mandatory refugee quotas on the member states of eastern Europe could prove very risky for above all Germany, the strongest economy in the EU. The very states Berlin is pressuring to join its refugee policy—Hungary, Poland, Slovenia and the Czech Republic—far from being helpless banana republics or economically in dire straits—as a group, the so-called Visegrád Group, constitute Germany’s largest trading partner, larger as a group than France or China. With the UK Brexit departure from the EU, there will be a major shift in voting weighting among the remaining EU member states. The major benefactor of this shift will be the Visegrad 4, especially Poland. If they maintain a common opposition to Brussels on key policies such as mandatory refugees, their political influence could become felt as never before. In 2016 according to the German Federal Statistics Office, foreign trade with Visegrad 4 countries amounted to 256 billion euros, exceeding German-China trade by more than 86 billion euros and German-French trade by more than 90 billion euros. As a recent analysis by the Dutch economics group GEFIRA points out, Central Europe has become the major recipient of Germany’s production investments, as well as a place where German companies are often relocated, employing already more than half a million workers. Labor costs in Central Europe are far less than in Western Europe and education is much better, a legacy from the communist-era stress on education. The Visegrád Group countries are second only to the United States in supplying to German exporters, which is vital for the continued competitiveness of the German economy. The V4 countries have a collective GDP equal to that of Turkey; they are economically indispensable to the “Old Union”, including Germany, which is treating Central European countries condescendingly and patronizingly. Brussels’ bureaucratic elite and the Western media are depicting Central Europeans as simple-minded fascists, a grave mistake bred from a special kind of bureaucratic arrogance. Before events come to a breakup of the EU from the east, especially now that a new Austrian government under Sebastian Kurz’s Austrian People’s Party has made clear their opposition as well to the Soros-Merkel-Brussels ongoing refugee policies, it might make sense to de-escalate the confrontation on the issue of refugees in the Visegrad 4 countries. If it fails to soften its stance, Germany and the German role in Europe could be the big loser along with the EU itself.